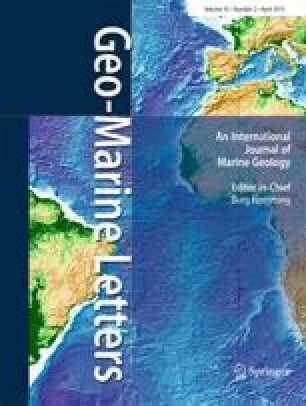 Sedimentary processes and the evolution of the wave- and tide-dominated, asymmetric Parnaíba Delta during the late Holocene were investigated based on geochemical and sedimentological analyses of sediment cores collected in 2010, as well as satellite images and historical maps. This is a rare case of pristine deltas essentially unaffected by human activities worldwide. The lowermost part of the main Parnaíba River distributary exhibits several low-sinuosity bends and several anastomosing bifurcation patterns in the east, whereas three NW–SE-oriented tidal channels drain a large mangrove area in the west. Dating of various materials in sediment cores from the tidal flats, tidal channels and supratidal marshes revealed that the oldest sediment (4,853 to 4,228 cal. years BP) is paleo-mangrove soil from the main river distributary. Present-day mangroves and marshes up to 200 years old exhibit high sedimentation rates reaching 3.4 cm/year. The asymmetry of the delta is explained not only by the wind- and wave-induced westward-directed longshore drift but also by neotectonic processes, as revealed by satellite images. Faulting and eastward tilting may have triggered delta lobe switching from west to east. This would explain the erosional character and unusual updrift orientation of the main river-mouth channel. Consistent with existing knowledge on mangrove ecosystems worldwide, sediment carbon and nitrogen signatures lie in the range of freshwater or marine dissolved organic carbon and C3 terrestrial plants. In the western tidal channels, the low Corg/Ntot ratios (16–21) of young mangrove soil (deposited in the last 16 years) reflect a stronger influence of marine plants compared to older mangroves (1,390–1,525 cal. years BP; ratios of 20–37). Thus, there would have been a greater influence of the Parnaíba River on tidal-channel sedimentology 1,400 to 1,500 years ago, entailing a natural connection between the present-day tidal channels and the river in ancient times, which was abandoned later during delta lobe switching. This is substantiated by historical maps that indeed show this connection between the main distributary and the tidal-channel system. The authors are grateful to the DFG for the financial support (grant STA401/16-1) and the Federal University of Rio Grande do Norte (UFRN) in Natal for personal and logistic support. Many thanks go to Jan Scholten and Nils Andersen for the Pb-210 measurements and help with their interpretation, to Niko Lahajnar and Martin Wiesner for the carbon and nitrogen measurements, and to Daniel from “Casa de Caboclo” for aid during the field campaigns. We acknowledge also A. Cooper and the anonymous reviewer, as well as the journal editors for useful feedback.